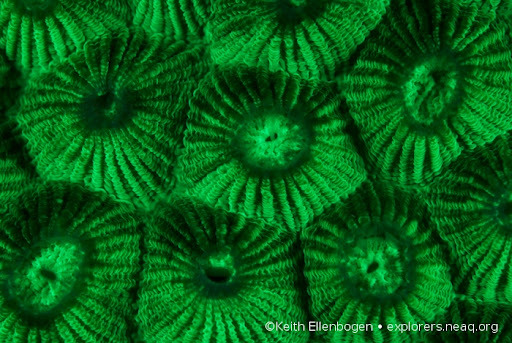 This is the sixth post in a series of daily photographs from an expedition to Totoya Island in Fiji by Keith Ellenbogen, an underwater photographer and frequent contributor to the Global Explorers Blog. 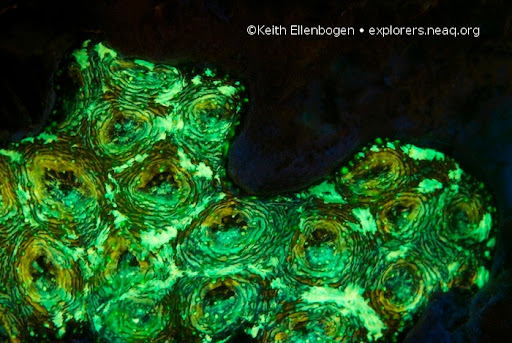 These images showcase a method of photography that demonstrate the fluorescent properties of organisms. It uses special blue flashlights that excite fluorescent wavelengths, and uses a yellow filter so that only the fluorescence can be seen. 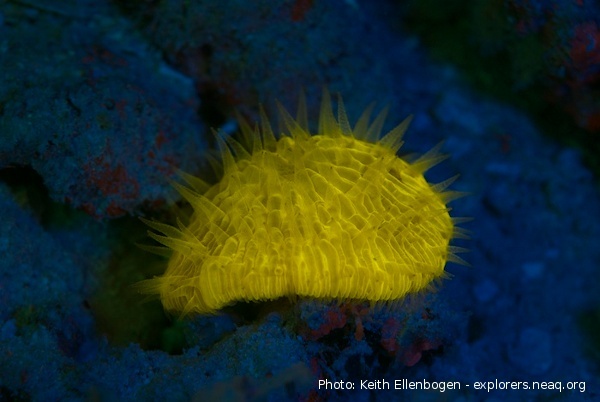 A fluorescent fungid coral (above) looks yellow; in regular daylight, it would look pinkish-brown. 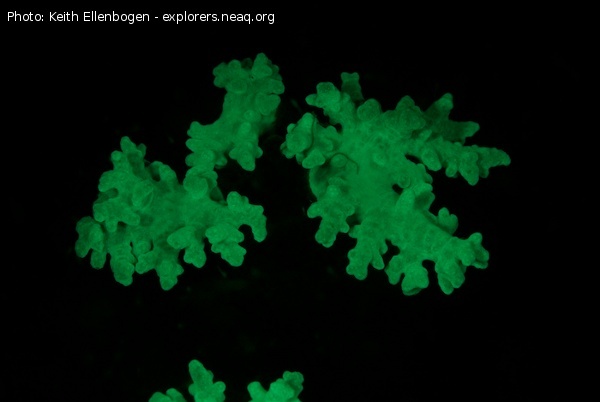 Fluorescence was first isolated in jellies (Aequorea victoria); but is also really common in corals. Many coral reef scientists are exploring the properties of fluorescence in the oceans; others are using fluorescence as a tool. An interesting paper by the Matz Lab was just published suggesting that fluorescence of some coral larvae may predict settlement. It is now very common for scientists to use fluorescent indicators or proteins to illustrate interesting biological pathways or impacts; for this reason, the discovery of fluorescence won the Nobel Prize for Chemistry in 2008. 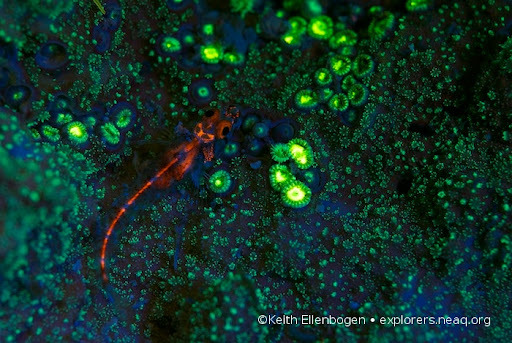 Whether for science or art, fluorescence offers a whole new view of marine organisms. This fluorescence technology invented by Charlie Mazel and marketed by his company Nightsea. 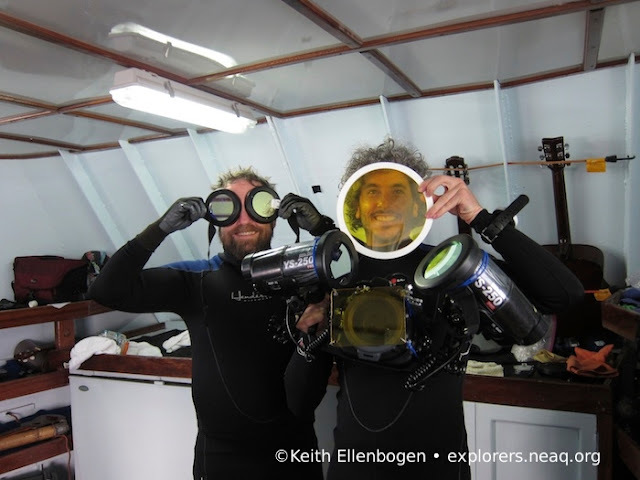 Keith started using this method during the 2010 Joint Aquarium Fiji Expedition. These images are from that previous expedition.